In the spirit of the holidays, I thought that I'd blog today about stuffing -- my second most favorite food for Thanksgiving after mashed potatoes. Luckily, there is a great recipe for a "Lighter Bread Stuffing" in my Betty Crocker cookbook (a must for anyone who wants some assistance cooking almost anything!). I've changed it a bit below, in order to make the recipe both vegetarian (so no need for a turkey!) and to reduce the calories (and increase the fiber) a bit more. (4) Combine remaining ingredients with broth and celery mixture (transfer to an oven safe casserole dish if necessary). Cover, put into the oven, and cook until the stuffing registers 165 degrees (approximately 35-45 minutes). Depending on what bread you use (I assumed each slice was 100 calories but it will vary depending on your bread), this recipe will come out to approximately 160 calories per serving, with 3 grams of fiber, and 2.5 grams of fat (or 3 weight watchers points). If you want to reduce the calories/points, consider removing the raisins, or reducing the amount of apples. I hope you enjoy your stuffing and have a great Thanksgiving! See you next Monday! mmmmm I think all stuffing should be made with apples- such a great combo! Thank you so much for the recipe! Have a great thanksgiving!! I love stuffing. I never thought of making it with apples!!! I'm so ready for Thanksgiving! 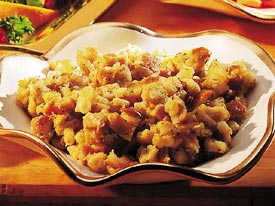 ooo stuffing with apples...perfect combo! This is a fabulous recipe!! I'm kinda bummed that I didn't choose to bring the stuffing this year ... we're not hosting, so I'm at the mercy of my in-laws. I will keep my fingers crossed that they have a delicious, healthy version like yours!! I love the addition of the apples! juliet, that stuffing looks beautiful!! i literally had a breakdown trying to make stuffing tonight. i chopped all my veggies, nuts, and got all the spices together, and then, chopped my bread. 2 minutes later, my mom says "joanna, can you double the recipe? you need to make more because your aunt says there's a few more vegans coming." of course, i had no bread left. great just great. haha i almost made cornbread for some reason, but then my mom offered to go to the store. thank heavens!! Great idea. I really enjoy apples in savory dishes. Yum. I like the addition of apples. Juliet, This looks delicious. Thank you for commenting on my blog! I am so glad to find your blog since you are a "fellow weight watcher" and food find guru!!! I'm looking forward to spending time on your site -I have lots of catching up to do!